To celebrate the 30th anniversary of the £1 coin, Money Supermarket is asking bloggers to give them as many money saving tips as we can. Since we enjoy saving and making the most of our hard-earned money, I put together a list of our top 30 money saving tips. Before buying anything ask yourself if you really need it. I have noticed that half of the things I used to buy, were not needed and most of the clothes would end up at the bottom of my wardrobe with tags! Write down a supermarket list before leaving home. It is so tempting to buy more products when you go out shopping, so write a list and stick to it. Stock up on essentials and make the most of 3 for 2 deals. Swap products in your shopping list, most supermarket products taste the same as branded ones, I honestly can’t see the difference in pasta and rice. Always check the reduced section before doing your shopping. I don’t believe that fruit and veg go off by the expiry date, so I have no problem buying it and having it the same day or following day. Pick up meat from the reduced section and freeze it on the same day. It will be perfect to be eaten once you need it, just defrost it on the day. Buy cheap cuts of meat and use it in a nice stew, they are usually very tasty. Try and create restaurant meals at the comfort of your own home. 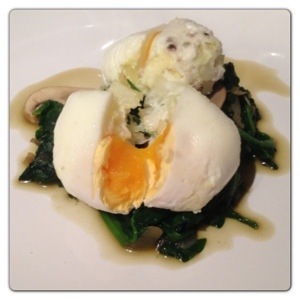 Check out my Flavoured Poached Egg with Mushroom and Spinach for inspiration. Cook an extra portion of food and take the remained in a packed lunch to work the following day. Not only it will be healthier, you won’t need to buy lunch. Online grocery shopping is quite good as you don’t get tempted by the big signs in the shops, so try and do as much online shopping as possible. Make the most of reward system available at supermarkets. You can swap Clubcard and Nectar points for family days out, restaurant and clothes. Get your fruit and veg from a local market. I noticed that they may not last as long, but they are much tastier and quite cheap, so definitely worth. If your food is about to go off, make a soup out of the vegetables and you can make a lovely Banana and Chocolate Mini-muffins with bruised bananas. Do lots of crafting at home to keep children entertained, using whatever you have. 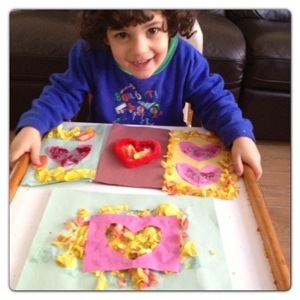 I shared my Crafting with Old Petals, little man had lots of fun crafting a card using old petals. Start growing your own fruit and veg at home. We have only just started Growing Seeds and it’s a lot of fun. Instead of using your Oyster card in London, check out whether it is cheaper to buy a monthly Travelcard instead. It usually works out cheaper if you use it for 5 days a week. Baking is great to entertain children and also save money on buying baked goods. I shared my Top 5 Tips for Baking with Kids. Start buying Christmas presents and wrapping as early as Boxing Day. Make the most of the Sales during the year to stock up on Christmas presents. Always eat and feed the children before leaving the house. Take lots of snacks and drinks on days out. They are usually much more expensive if you purchase from attractions, so take them from home. If you enjoy going to the cinema, check out reduced days. Everyone likes pizza, so instead of paying full price, check out their online deals before placing an order. Turn down the heating at home by a degree or two. You won’t feel the difference, but your bill will reduce substantially. Check out money saving website like Money Supermarket for discount vouchers on family days out and restaurants. If you are due to renew your home and car insurance, check out comparison websites such as Money Supermarket before your current cover expires. Instead of making expensive international calls, use Skype instead. It is free and you also get to see each other. Instead of sending a SMS, use Whatsapp as it is free. If you enjoy reading, join a library and borrow books instead. What are your top money-saving tips? 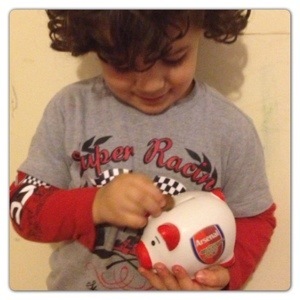 This is my entry for the MoneySupermarket.com 30 Ways to Save £1. 4 Responses to "My Top 30 Money Saving Tips"